Charlotte’s image of the nature walk included the mother sitting on a large blanket and sending the kids off to find what they can find. They would return with their finds, or describe what they had seen to their waiting mother. This might work well for you. Others may use a blanket as a “home base.” I cannot help but walk with my children and find things. I don’t want to miss anything on our nature outings, and my enthusiasm is contagious. Either way is fine, I believe. The kids love to find natural objects and learn from them what they can. They keep notebooks, recording their interesting discoveries. They make connections when they read about something they have seen on a nature walk. They develop a strong, respectful relationship with life and its Creator. Nature study becomes the basis for the study of all other sciences—geology, biology, chemistry, physics, and astronomy can all be observed in nature. Mount Holyoke College has a lovely tradition: On a crisp October morning at 7am, the morning bells continue to ring past 7, signaling that classes are cancelled. Because many students choose to climb the local mountains on their day off, the day is called “Mountain Day.” I have carried this tradition home, though we try to have our “Mountain Day” once a month, as a special addition to our usual time spent out of doors. Our “mountain” is a local preserve with several different environments—fields, forests, pond, seashore, and even old ruins. Best of all, it is free! Mountain day is not a substitute for getting out daily! The mountain day location is a special place, away from home, where we can observe the seasonal changes, wild life, plants, and weather. Mountain day is a treat, wildly anticipated by the whole family. Nevertheless, we still go out as much as possible, on a daily basis. No place has all of these environments, or course, but many parks and preserves have several different areas to explore. Check with your local parks department for advice. They can also tell you any rules and regulations. Many preserves forbid collecting anything (a real let-down for unprepared kids). Other places will make exceptions for “schools.” Still other preserves require permission to use the area. While this may require filing forms and a short waiting period, restricted areas are great since they are never crowded. This is not a cliché. Most back yards are teeming with wildlife of some sort. As a city dweller, I never cease to marvel at the fine variety of life in my yard. Spend time in your yard as you take meals, and see how many kinds of bird, insect, plant, etc. that you see. If you keep a perfectly manicured lawn, with only one kind of grass (need a field guide to help you learn your lawn? 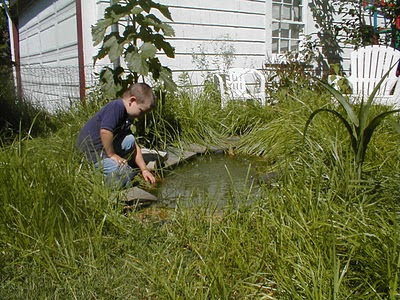 ), you can make your yard more attractive to wildlife. Hang a birdfeeder. Add a birdbath. Try piling up some old hedge clippings to make a brush pile. Dig in the soil. You might consider starting a ‘succession corner.’ Choose a small area. Don’t mow, spray or treat the area. Watch. The grass will grow long, weeds will grow, and young trees might sprout. Different insects will arrive. After a few years, you might start a second succession area beside the first, and see how much faster succession takes place. For more backyard ideas, check out MacBeth's Opinion (a small bookstore, in association with Amazon.com), including a "Swallows and Amazons" page! Charlotte encouraged her students to keep nature notebooks. The children themselves always do the drawings, and the notebook may include poems, narrations of the natural objects, and pressings of leaves and flowers. Any blank notebook will do, provided it has room for our young naturalists’ pictures. Sometimes they draw right on the pages of the notebook. Sometimes they draw on separate paper and glue it in later. Poems we find, and any other hand written work is added neatly. The work in a nature notebook is the child’s work, and is not subject to correction. As the years pass, we notice natural improvement in the drawing. As the child becomes a more accurate observer, so his artwork reflects the change. He may never be an Audubon, but he will look back on his work with fondness. A nature notebook is a great habit (Charlotte liked habits) that can stay with us for life. Moms and dads can set an excellent example for the children by starting their own notebooks…I have! Need help getting started? Need hints on drawing natural objects? Try Keeping a Nature Journal by Clare Walker Leslie. This wonderful book has more suggestions that I could ever think possible, including hints for "speed drawing." Also, I have enjoyed using watercolor pencils. Try Watercolor Pencil Magic for helpful hints on using these. Remember: Boots are always shorter than the water into which you wade. Always tell someone your plan--where you are going, and how long you'll be gone! It has been a while since I have had access to the main MacBeth's Opinion site. I have not been able to add or edit content, and so the pages are a bit dated. I figured I would toss the old pages up here, link them in a sidebar somehow (experimenting here...), and edit at will. Any suggestions or hints are welcome.